We all want our BOE environment to perform to the best of its ability. We want to be certain that no particular component of our environment’s architecture is a weak point or bottleneck. As a result, given the time and the hardware, most of us would love to deploy a distributed, well-balanced Business Objects Enterprise environment. In many cases this would include putting each tier or group of services on their own machine/node: the Intelligence Tier (CMS, FRS, etc. ), the Processing Tier (Report/Processing, Job, etc. ), Web Application Tier (where InfoView and CMC are deployed), and Web Tier (HTTP/HTTPS services). Aside for using multiple servers for each tier, if you read the documentation closely, you could be tempted to take your distribution to the next level. What is “Split Mode”, “Split-Web”, “Split Deployment”? 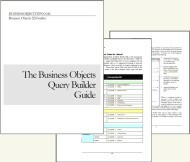 The SAP Business Objects “Web Application Deployment Guide” explains that “you can deploy all web application resources on a single web application server (standalone mode), or to separate dynamic and static content for deployment to de-paired web and web application servers (split mode).” The dynamic content, the part requiring actual processing would be deployed to the dedicated Web Application Server and the static content (images and client side scripts, I believe) would be deployed to a dedicated Web Server. The reason behind creating a split mode web deployment would be to better distribute the load of Web Application Server, giving the otherwise under utilized Web Server a little more responsibility. My mother used to play a game with us (when we were children) that we called “same or different”. It quickly became and inside joke, a way of indirectly making a comment on something, for example, I would ask my mother something like “Business Objects, a simple/stable/scalable out-of-the-box experience; same or different”. Now I didn’t say that all of them were witty gems. The truth of the matter is that even if you are successful at deploying Split Mode you won’t find that it makes your life, or that of your servers any easier. It is extremely difficult to get Split Mode working. The guides would have you believe that it is a simple matter of using different parameters with the WDEPLOY application. This may be true for creating the packages to deploy, but actually deploying them and getting them to function is quite a different task. If you are able to get split web working then you have joined the ranks of a very select few and you have also probably burned through at least 3 or 4 of your SAP Business Objects Support Customer Message allocations. So what did all of that work get you? Not much, in fact, even if you are monitoring the servers closely you may not see any change in the actual load on the Web Application Server, even with a large user base. Not to mention, each time you install a FixPack or Service Pack you will have to recreate the magic all over again and ask yourself, was it really worth it? These are not just my personal experiences and observations. Seasoned Business Objects consultants have expressed similar discontent with this feature. My limited Internet research (forums, mostly) also confirms my findings. I would love for anyone to share their own experience with split deployments in the comments.